Autumn is my favourite time of year. The mind starts to wonder towards crisp, fresh days full of long shadows and even longer bike rides in the countryside. Gone are the heady, heavy, clinging days of summer which alternate between downpour and cloying heat and here instead are bright days of clear light and quiet roads. If you've not yet got out of the city for a two wheeled adventure you've only got a few weekends left before the light begins to fade, but even though the colours are turning from golden summer to ochre and brown there's still fresh air and freedom in abundance to be had. At this time of year there is always the risk that your cycling adventure might be interrupted by a sudden, brief, shower of rain - or if you're very lucky an hour or two in the afternoon of hot sunshine - so in today's post we examine the best media to pack for your Autumn bike tour to keep you entertained when you're sheltering under a tree in the country somewhere. Gone are the times when you had to cart around a map, a compass and a set of good books to read on the back of your bike with you. These days, smart cookies take an e-reader or tablet computer around with them, and the literature market is responding appropriately. London cycling supremo Jack Thurston of The Bike Show fame is Editor of new venture "The Bicycle e-reader"; a Grantia-style tome packed with engaging and beautifully written accounts of life on two wheels. Famous penman and cyclist Mark Twain is included here, as are authors Russ Roca and Alex Baca. The thinking behind The Bicycle e-reader is sound too, as Jack explains; "There is a great deal of brilliant article and essay-length writing about cycling that remains inaccessible to most readers. Some of it languishes out of print. 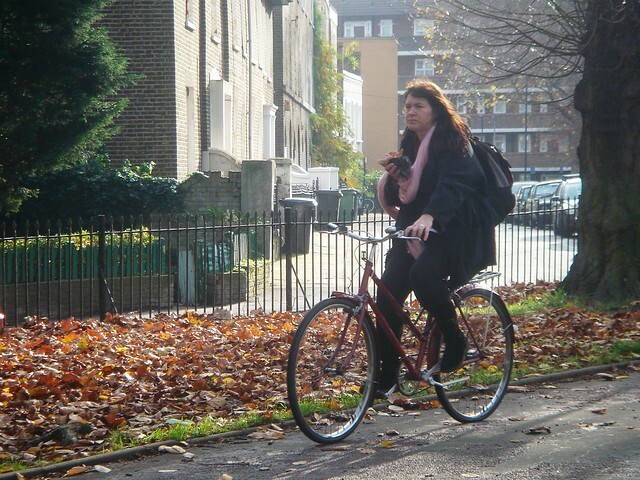 Other pieces appeared in publications read by only a tiny minority of cyclists. Likewise, Kindles and other eBook readers are the natural companion of cyclists. They are light enough to fit unobtrusively in the saddle bag and have a battery life capable of providing reading material on even the most sustained odyssey." A match made in heaven? At only £1.53 to download and keep I think so, and I could happily see myself enjoying the post ride glow with a thermos of hot tea whiling away an autumn afternoon with the Bicycle e-reader as my companion. An Autumn edition will follow soon. Here's the link. New to cycling, or an old hand who is still paying someone to change their tires? (Mea culpa!) Been riding all summer and want to know how to keep up your new found cycling enthusiasm? Want some new cycling routes to explore, or an enthusiastic push towards further cycling adventures? Then the London Cyclist Handbook is for you. Pulled together by London Cyclist blog editor Andreas Kambanis this e-book shows you everything you need to know to become, and remain, a committed London cyclist. From how to start cycling, to how to find your way around and learn to love the streets of London, from getting oil stains out of your clothes to how to up your cycling ante and join a big boy's cycling club – it's all here for you, and best of all you can summon up the pages you need just when you need them on your e-reader. Bike maintenance books are no good if they languish on dusty shelves at home whereas an e-book like this could literally talk you through road side repairs step by step! Consider it your pocket cycling buddy – at £10.95 for the entire, comprehensive tome it's a stitch and you'll never have to buy him beers after he's beaten you in a race up Box Hill. Step this way. All this reading not for you? Rather let your mind and imagination wonder? 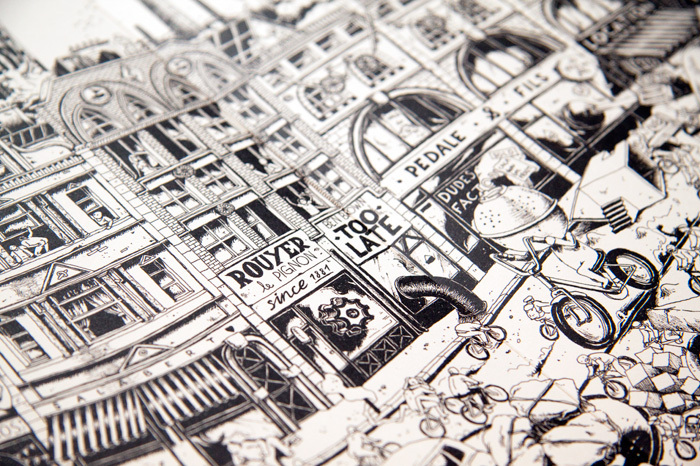 East London mini press Nobrow have just released "Bicycle" by Ugo Gattoni – a gargantuan, grotesque, captivating two metre long pen and ink drawing of a wildly imaginative fictional bike ride across London. 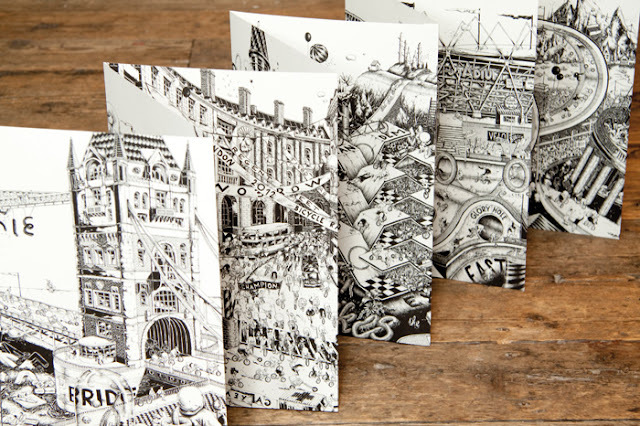 Try and picture "Where's Wally" on speed on tiny little bikes and you might begin to get the idea, but you really have to see Gattoni's concertina book in person to reveal the stunning depth of detail that it contains. Here are cyclists racing up the tower of St Paul's Cathedral, and here is the Olympic Stadium as tiny cyclists swarm across it. There's Big Ben as you've never seen it before with a loop-the-loop cycling race track coming out of it (seriously, Boris, we need to build this!). There's lots of tiny details to keep London cyclists of all backgrounds amused; re–imaginings of popular cycling haunts and even a few familiar faces. If the weather puts paid to your autumnal cycling plans then Bicycle will help you while away the hours and have an adventure in your mind instead. I recommend this affordable and unique artistic take on the London cycling scene. You can buy Bicycle here. Everyone knows that cycling, great art and great thinkers go alike but new US group Nora and One Left take things to a new level and dedicate their entire latest album to the humble bike. bicycle is the debut offering of the Washington based band and is available now to purchase online as download or in CD format. Nora's charming, sweet vocals are warm and unobtrusive and she's supported by a talented backing band of musicians who help the album to gallop along. The upbeat folky track 'Cycle Chic' is especially cheerful and uplifting as it takes us on a tour of the global phenomenon that are the Cycle Chic blogs of the world and soon had me tapping my feet and day dreaming about bicycle rides in far off cities. The perfect accompaniment to an afternoon indoors planning your next bicycle tour, or the sound track for a cycle picnic, I couldn't help but enjoy this delightful album. You can buy direct for download, or via iTunes or check out Nora's website. All this should whet your appetite and have you conjuring up new cycling adventures in no time. Have you read any cycling-related books recently? Any recommendations that you care to share? Bicycle Diaries by David Byrne (of Talking Heads fame) is a lovely account of his experiences cycling around various cities in the world, combined with very convincing arguments on how designing cities for motor cars destroys them for everyone whilst designing them for cyclists and walkers makes them immeasurably better for everyone. The Hungry Cyclist by Tom Kevill-Davies is a great account of Tom's cycle across and around the Americas in search of the perfect meal. Unlike many epic bike ride books which make you feel inadequate when the author is covering 100 miles before lunchtime, Tom always comes across very normal and ever so slightly out of his depth. Hope for us all yet! Thanks for listening and including us on the packing list! Hope to ride and sing with you "down the road"!